Has The Late Show defanged Stephen Colbert's political bite? Has Network Television Defanged Colbert’s Political Bite? Yep. But here’s why that might not be a bad thing. Losing Colbert felt to many liberals like the loss of political oxygen. More than any other recent popular satirist, he was a voice that absorbed this country’s worst mass delusions—whether they were about a nefarious “gay agenda,” a global warming “conspiracy,” the premise that half of the country was made up of mindless moochers addicted to the government teat, or any other false threat in the culture wars—and exposed these ideas and those who propagated them as frauds. While other programs did something similar—particularly The Daily Show, where Colbert’s character got his start—the Colbert persona was a form that transcended parody to offer a sort of magic mirror into a world that seemed to be one giant web of lies. “Unlike, say, what The Daily Show does … my show is a false construction of the news as opposed to a pure deconstruction of the news,” Colbert told former Slate editor David Plotz in an interview last year. Now Colbert’s “Colbert”-less Late Show has been on the air for just about three months, and, surprisingly, it is as politically themed as his old show. He has devoted regular segments to poking fun at the day’s biggest political news (with a specific focus on GOP primary polling leader Donald Trump), invited public intellectuals and government figures to discuss serious issues ranging from inequality to the Iranian nuclear deal, and interrogated a stream of politicians, including a handful of the top contenders for president. So were the worst fears of Colbert Nation about the loss of a central figure in the ongoing progressive fight for America’s soul actually overblown? Not exactly. Colbert’s political commentary—while still incredibly smart, funny, and among the best infotainment in the country—is now squarely in the “deconstructionist” category, which you can get in many other places. And unsurprisingly, it’s tamer than it’s ever been. The new Colbert has all the humanity and passion and humor of the old Colbert, but his politics have lost a lot of his old bite, surely in part to meet the new challenge of having to cater to a wider and more diverse audience (a challenge every late-night host making a similar transition has faced). These compromises make for a far less pointed—and often less essential-feeling—Colbert. The new Colbert approaches the “present political struggle” much differently, making near-daily jokes about the ridiculous size of the presidential field and the physical appearances and fabricated personas of the candidates. But he’s less focused on the toxic ideology and ignorance that undergird the spectacle. 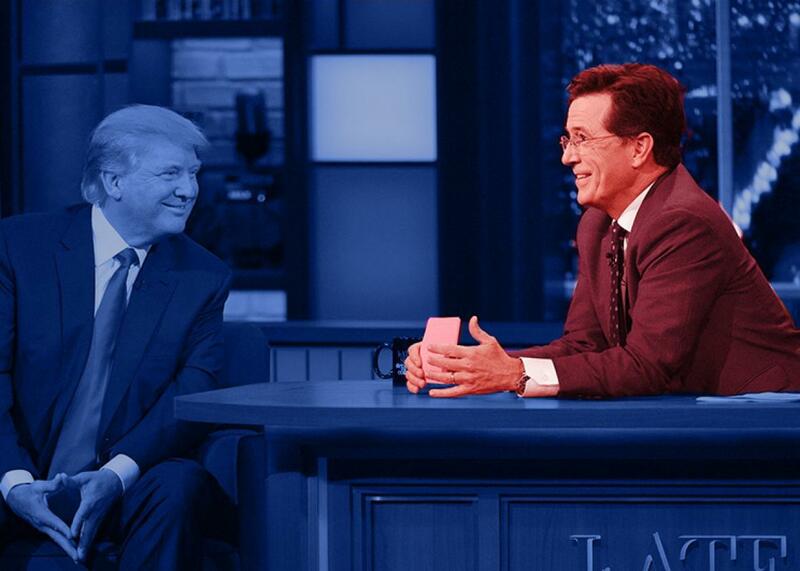 When he got a chance to interview Trump, multiple outlets criticized Colbert for going soft. And it’s true that he didn’t directly call out Trump for his blatant bigotry and demagoguery, choosing instead to needle him on small points like the practicality and ugliness of his proposed Mexican border wall, and lobbing him softballs about what it’s like to be getting so much attention. Again, it was fun. And Colbert was much harder in an interview with Texas Sen. Ted Cruz, presumably (and maybe justifiably) because Cruz is a more serious candidate. But Trump is running one of the ugliest political campaigns in modern American history and to not even attempt to puncture that feels like a missed opportunity that the character Stephen Colbert would never have let slip away. Similarly, when he had a chance to truly challenge Democratic front-runner Hillary Clinton in a one-on-one interview, he took a pass. The same thing happened in his opening show’s interview with Jeb Bush. Compare Colbert’s kid-gloves treatment of three figures who have all been front-runners for their party’s nomination at various points to what may be his defining moment as a political commentator: the 2006 White House Correspondents’ Association Dinner. Standing a few feet away from the sitting president and in front of a room full of Washington, D.C. power players, Colbert dismantled the entire premise of George W. Bush’s administration and flatly proclaimed what its deceits had meant to the world. Colbert is clearly figuring out how to package his political views in a way that expands their reach and makes them palatable to those who might not naturally appreciate them. The Colbert Report finale attracted 2.5 million viewers; The Late Show With Stephen Colbert’s debut attracted 6.6 million. Even as the show’s viewership has seen an inevitable decline since then, the audience he is reaching on CBS is still dramatically different than the demographic that tuned into his Comedy Central show. He already perfected the exercise of feeding eager young liberals exactly the kind of political critiques they already believed. So there’s value in a show that figures out how to smuggle his political views into mainstream American living rooms like a Colbert-shaped Trojan horse.